In order to be able to export the revenue numbers from Jackrabbit to your QuickBooks account there must be an Undeposited Funds account in the QuickBooks Chart of Accounts. The payments received from your customers are posted to this account in the journal entry created during the export. If you do not see this account in your QuickBooks you will need to add it prior to your first export. The Undeposited Funds account in QuickBooks is classified as either a type of Current Asset or an Other Current Asset. Watch the QuickBooks Online Overview video tutorial located here for more information on adding the Undeposited Funds account. What is this Undeposited Funds account all about? Think of it as an envelope where you keep checks/cash until you take them to the bank. It is what is called a 'clearing account' and is intended as a temporary landing spot for incoming funds. The account should clear out to zero when you deposit the funds by creating a Bank Deposit in QuickBooks. 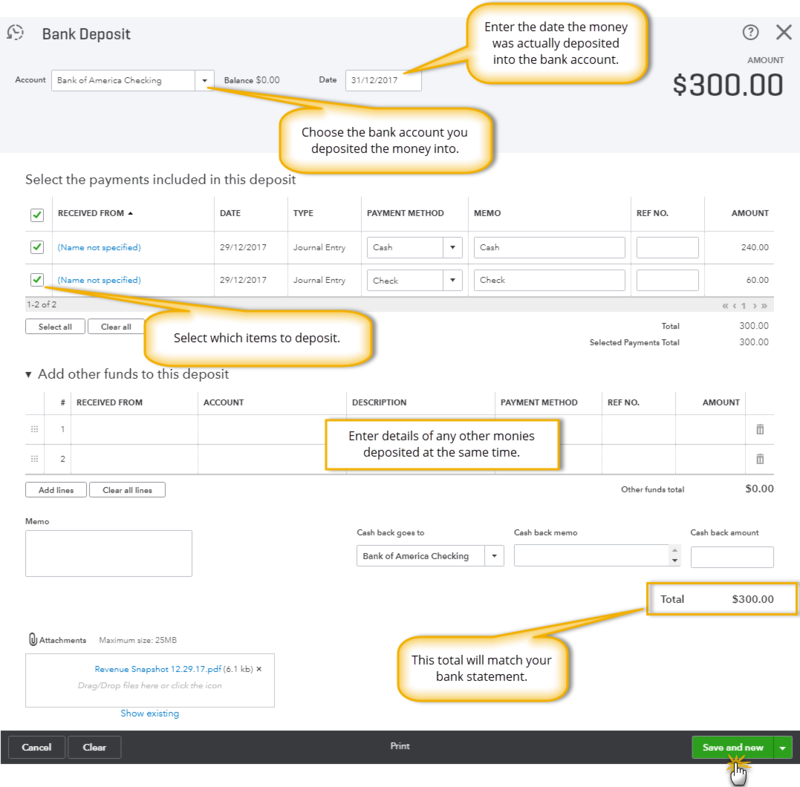 The QuickBooks Bank Deposit function allows you to group payments received so they are in agreement with what actually hit the bank on a particular day, making it easier to reconcile your bank statements. In the top menu bar of QuickBooks, click the + sign (will become an x when expanded) and select Bank Deposit. Select the bank account you are depositing the funds to. Enter the date the deposit actually hits the bank account. Use the checkboxes to select the items you wish to include in the deposit. If any other funds are being added to the physical bank deposit that are not listed, use Add other funds to this deposit to enter the details of those funds. The total of the deposit should match the deposit slip taken to the bank. Click Save and new. If you are using ePayments in Jackrabbit, a separate deposit should be entered for cash/check and then another for the credit card/bank account payments. This is because the ePayments have a settlement time and do not hit the bank at the same time a physical deposit that is taken to the bank does. The goal is to have each deposit made in QuickBooks be the same as what you will see on your bank statement on any given day.